I was in Portland, Oregon over the weekend for the JET Alumni Association Regional Technology Conference. On Sunday, after the Conference ended, I went with LL to check out Portland’s much acclaimed Pok Pok Thai restaurant. The restaurant is a bit off the beaten path, but definitely worth the trip. It’s built to resemble a Southeast Asian pub shack (which is a little cold for Portland, but they had space heaters). The Suntory whiskey I had with the meal helped warm me up too. Despite the shiver, I have to say that this was some of the best Thai food I have ever had outside of Thailand. No generic pad thai or “traffic light” (red, yellow, green) curries here. Only intensely flavorful dishes meant for sharing, featuring hand pressed coconut milk and the freshest of herbs. Special Northern Thai herbal salad with ginger, carrot, parsnip, betel leaf, basil, lime leaf, sawtooth, fried shallots, cashews, peanuts, sesame seeds, dry shrimp, ground pork and Thai chilies in a coconut milk dressing. I’ve never had anything like this before, but it kind of reminded me of a Japanese kinpira on acid. A definite party going on in my mouth. A taste revelation. Carlton Farms baby back ribs marinated in whisky, soy, honey, ginger and Thai spices. slow grilled over charcoal and served with 2 spicy dipping sauces. I’m not usually a ribs person, but these were very well executed. They kind of reminded me of jerky or Cantonese char siu, in a good way. Northern Thai mild curry noodle soup made with our secret curry paste recipe, natural chicken on the bone and house-pressed fresh coconut milk. 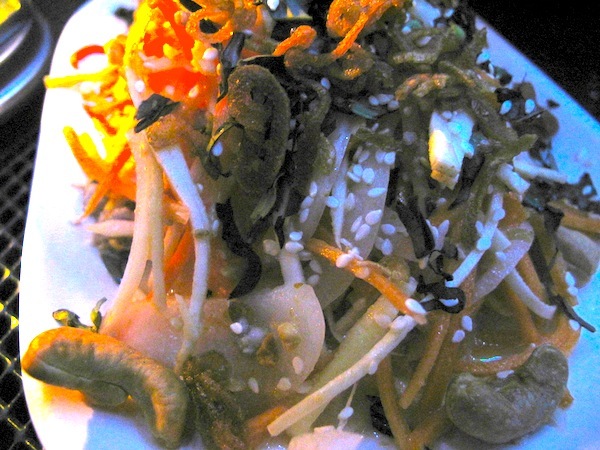 Served with pickled mustard greens, shallots, crispy yellow noodles and roasted chili paste. Chiang Mai specialty, with Burmese origins. My favorite Thai noodle soup! It’s not on many Thai restaurant menus in the US, but it should be. 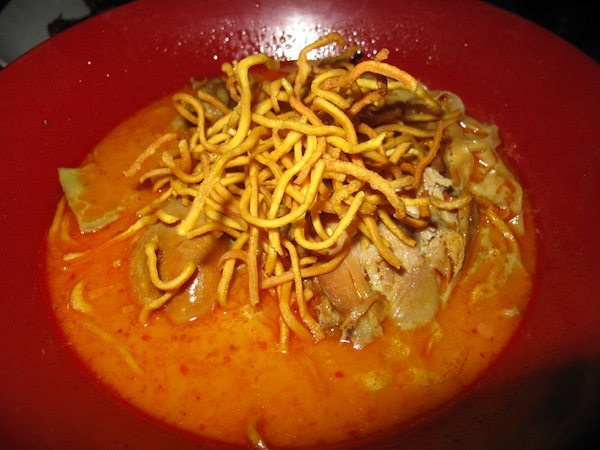 Pok Pok’s khao soi is rustic, with big chunks of chicken on the bone, falling apart tender, and a perfectly balanced coconut broth. I wish there were a little bit more broth though, ’cause I downed every drop. 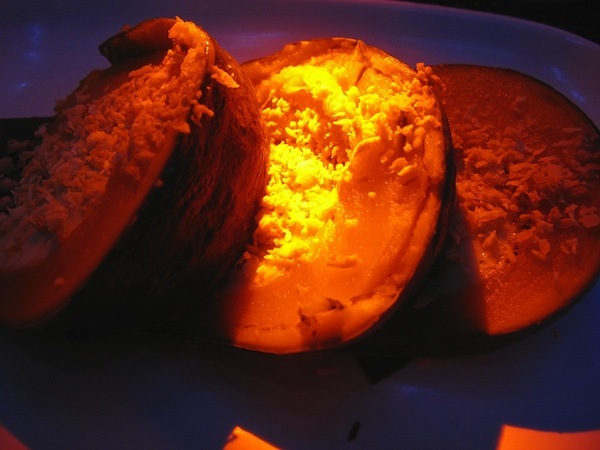 Steamed Kabocha pumpkin, filled with coconut-palm sugar custard scented with pandanus leaf. The kind of expected this to be warm, or at least room temperature, but it came cold. Still really good though. I think maybe just a dash of salt would have offset some of the sweetness and made the flavor of the kabocha really pop, but that would be gilding the lily. BTW, the desert portion was more than enough for 2 people to share.